From my experience in shooting either the 308 or the 3006 there are a couple of bullet choices that I recommend. The 308 caliber rifle likes the 150 - 165 grain bullets. You get superb accuracy without sacrificing too much velocity. Most target shooters of the 308 choose the 155 grain as their primary bullet choice. For the 3006 I prefer my bullets in the 180 grain. Again, it's an accuracy choice but just as important (this is true for the 308 too), is the performance of these bullet choices. These are just my opinions and I know there are lots of guys out there that would argue otherwise. It boils down to what I have seen that works and works well. Ok, so we aren't talking punching paper, nor are there any bulls eyes painted on your moose but I say that and having an accurate rifle and NEVER having to worry about the accuracy of it will take a lot of pressure off the hunter. I'm with you Barry, the lightweight frame and short action of the 308 makes it a superb moose hunting rifle cartridge. 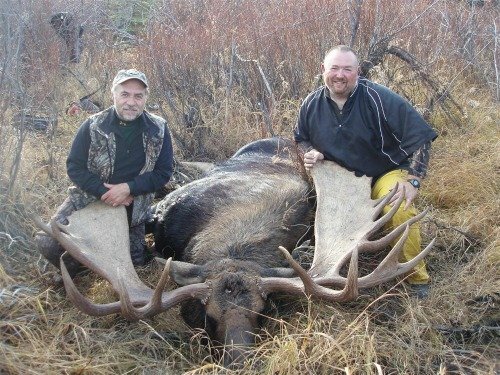 Barry Demchuk and his cousin Blaine Demchuk (right) with a beautiful Yukon Moose. Blaine guided Barry on this moose hunt. The bull measured 75 1/2 inches non-typical. Now the bullet manufacturer choices are another matter. I recently have decided that I going to go away from any bullets that contain lead! That decision in itself will limit my choices. You may ask why? I recently wrote an https://www.all-about-moose.com/lead-bullets.html article that outlines the lead bullets and how we may (unknowingly) be giving ourselves low doses of lead poisoning! The importance of having a bullet stay together with penetrating bone cannot be understated. Hunters must choose bullets that will perform well in their rifles and get the job done. Solid bullets and partition styles will perform well. You just have to find the one that works best in your rifle, or pick one that you believe will work best then work the loads until you are satisfied. I switched to partition bullets about 10 years ago after a lead core bullet disintegrated and incredibly I watched a moose run away. I got a second chance at the same bull the next day (that's how I know the bullet COMPLETELY FELL APART). That brings up another point... shot placement. Barry, you obviously understand the importance of firearm accuracy (building a custom rifle) then I'm sure you also understand that shot placement is important too. It doesn't matter if you shoot a 416 or a 270, a poor shot is a poor shot and no amount of firepower will rectify that. I've been using partition and Trophy bonded for my magnums for many years with decent results, the swift a-frame was the best in my 7mm but don't come in a factory load for win 308 bullets that fragment are not to be used for sure. Not only for the animals sake, but for sure as you stated in your good article, no animal deserves a slow death due to improper bullet construction. Only reason I decided to ask you on some advice, is that I am somewhat new to my 308. I know that calibre with certain velocities work better with certain bullets and I want as quick and clean a kill as possible always especially with moose which can travel a long ways in terrible terrain. I know of certain guides and PH's that hate partitions, and other hate Barne's products I have never used the TSX or TTSX which many really like. I believe that my 308 and 165's would be as close to your 3006 with 180's in the partition as I could get. Right now the Federal 165 Trophy Bonded Tip shoots groups around 1" and the Nosler 165 partition is just a hair worse but very good for such a light rifle I designed it to be under 6lbs total in weight for carrying around since my shoulders will take a long time to rehab. With a special brake the recoil is much like my old 270. Perfect for floating, quading, or horseback and I can walk with it all day without shoulder fatigue. I have not tried the TTSX or any other yet, I don't really want to start reloading if the factory ammo is good. Saw a program the other day on TV where the hunters used the 3006 165 trophy bonded tip on elk with devastating results and later for African game with the same results, can't argue with their success and shot placement. Also later saw a 14yr old boy take the same game with pretty much the same result with his lightweight 270 and 130 gr TTSX that was very impressive as all animals virtually fell in their tracks. Never seen that kind of bullet performance. I was just wondering that with all the moose kills you've been part of and heard of, your personal 308 bullet choice for moose as I value your advise you have see and been part of more hunts than I for sure. 165 is probably the way to go in the partition or bonded for sure, but is it worth trying the 150 or 168 TTSX in your opinion for the 308 bullet choice for moose and it's lower velocity? What the rifle shoots the most accurately will be the final factor, but I want to come as close as I can to the best combo that will ensure the fastest kill with proper shot placement. I am a very good shot, I learned from some of the best. Let me know your best picks for the 308 bullet choice for moose in order and I'll try them. What would you use if it was your gun???? Sometimes a perfect broadside lung shot is not possible, so something very tough for a shoulder shot is necessary. Sending you a pic of my 76" Yukon moose I got last year with my 7mm before my rotator ops. I have a hunting trip in Nov in Alberta this year and I'm off to the Yukon next year for a moose float again...nothing better than floating and calling for moose in the fall...my absolute favorite hunting by far and the eating is the best. Have a great season yourself and thank you very much for taking time to talk with me. Will send you a pic of the rifle's handy work when I get something. Ok Barry, You asked, "If the 308 in question was my moose hunting rifle which would be my 308 bullet choice for moose?" "The TTSX differs from the TSX in that it features a re-engineered nose cavity that accommodates a polymer tip." That little polymer tip supposedly improves the bullets ballistic coefficient numbers, so I think I'd try that one before I tried the TSX. If you are using factory ammunition your choices will be fixed to what is available across the shelf. The 150 grain bullet will give you almost 300 fps more velocity than the 165 or 168 grain, tipping the velocity scales at very close to 2900 fps. That will give you a nice flat shooting, hard hitting 308 bullet choice for moose hunting. One of the great things about solid copper bullets is the weight retention and potential to penetrate even those tough shoulders you mention. Sure the partion and bonded bullets will do that too, then you have to worry about minute lead fragments penetrating your game meat. You have to consider your budget too of course, as factory ammo isn't cheap. Let us know what you find out and how it works for you. My vote for 308 bullet choice for moose goes to solid copper.